Patti Charrette is a self-professed animal lover, so when she saw that a family of foxes had made a den in the ditch along Waldon Road near Waldon Middle School she wanted to warn drivers to slow down and be aware that there were pups in the area. She even got township permission to post the signs – 10 in all – along the road to try to protect the mother and her pups. A family of foxes is called a leash or a skulk. But some hound skulking around the area decided to remove the warnings and disappeared into the night with Charette’s signs. Apparently, someone had called the township offices complaining that the signs were too exclusive. “Someone complained, saying ‘Why wouldn’t we put up signs for all animals,’” Charette said. Charette, who lives in the Waldon Road area, put the signs along the road last Wednesday. By Thursday, the signs were gone. On Friday, Anthony Reighard, owner of M&B Graphics, and his staff made another sign for Charette – which she placed on the side of Waldon Road. The story even garnered coverage from WDIV Channel 4 in Detroit. But Charette’s humane gesture – and the ensuing theft – touched many in the Lake Orion community, who praised her for trying to protect the vixen (a female fox) and pups. Charette posted the ordeal in the Lake Orion Chat Room, getting support from dozens of people. 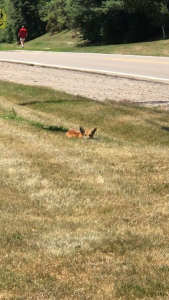 “Now that more of the community knows about the foxes and the signs, hopefully whoever took them will be deterred from taking them again,” Charette said. Charette also points out that many animals don’t make their dens right next to the road, so that’s why she felt it was necessary to put up the signs in this particular case. Charette also said she was touched by the outpouring of support and share a story about grandmother who went to pick up her grandchildren to show them the signs.